Shaded by a 100-year-old oak tree, this very special home ‘lives’ on 30 vineyard acres and is off Dry Creek Road, just one mile west of the north end of charming, upscale, historic, Healdsburg in the heart of Sonoma County’s Wine Country. Newly renovated, this 3 bedroom/2 bath, Ranch House with central heat/AC is beautifully landscaped and decorated with European styling, wall paper, draperies, clean Scandinavian lines, and warm wood flooring throughout, and newly landscaped backyard with Sundance Spa. Enter and enjoy the open flowing floor plan with the living room area to your left and the dining area to the right, and the kitchen just beyond.A decorative fireplace with candelabra, sleeper sofa (full size), 2 leather chairs, and a lovely area rug with coffee table, grace the living room; entertainment is provided by the Sharp LCD HD 26” wide screen TV with a Sony HD DVD player and a Panasonic compact audio system with CD, cassette, and radio. The dining area with beautiful built-in floor to ceiling cabinets, is a warm, welcoming, and wonderful space for sipping, supping, and good conversation, and the dining table expands to seat 8+, with 2 more spaces at the counter.All new kitchen cabinetry (one is lighted with glass shelves and doors), black granite counter tops and all new GE stainless steel appliances, contribute to a wonderful cooking experience. Your chef will enjoy using the very efficient ceramic cooktop with oven below and a built-in microwave-exhaust vent combo above; the fridge, dishwasher and large stainless steel double sink complete this very efficient and well designed kitchen.There is also a second ‘overflow’ fridge in the garage for extra vittles, vino, and beverages. A short hallway leads to the master suite with a luxurious king bed, wood floors and area rug, vineyard views, and a newly redone ensuite bathroom with a granite topped vanity and large beautifully tiled shower.The second and third bedrooms are also wood floored, one with two double beds and one queen bedroom. When also using the living room double sleeper sofa, ‘Big Oak’ can accommodate as many as 8guests, if you do not mind getting cozy with family and/or friends, although ideally suited to smaller gatherings.The lovely second shared bath also has a granite topped vanity and a tastefully tiled large shower to facilitate preparing for your dates! Beautifully landscaped, the front yard, shaded by the Big Oak, has two lawn areas, abundant plantings & shrubs, and a front porch seating area to watch the world go by.Leading to the 2-car garage, is a large driveway and the backyard is fenced with acres of vineyards just beyond and a back patio with table and chairs, umbrella, and a Wolf propane BBQ for your grilling pleasure (a Weber briquette grill is also available for the ‘kingsford’ purists). Enjoy the Sundance Spa in the newly landscaped backyard. The Big Oak Vineyard House is very conveniently located and a great ‘home base’ for exploring the diversity of Sonoma County Wine Country.Only minutes away from Healdsburg, the ‘crown jewel’ of our ‘Tuscany’ in northern California, you will need plenty of time for wine tasting, fine dining, shopping, art & antique galleries, and enjoying the Russian River with many more adventures nearby. In addition to overlooking the beautiful vineyard of West Wines, the West Wines Tasting Room is just next door to the home for an up close and personal wine tasting experience. • Quiet hours must be observed between 10:00 p.m. and 7:00 a.m. Please help us preserve the serenity of the area and keep us in compliance with the ordinances. Thank you and we hope you enjoy your stay! 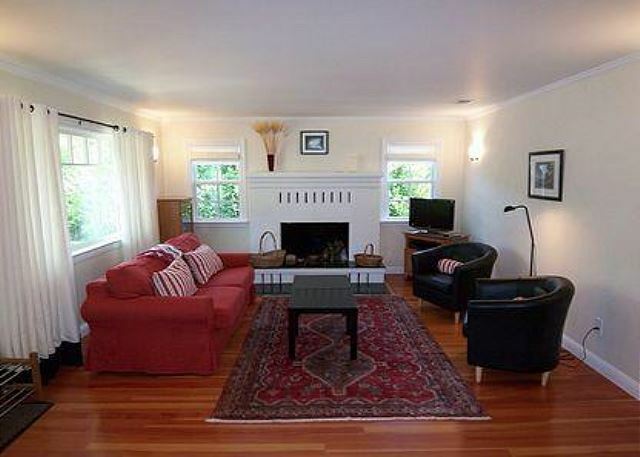 We were looking for a house for 5 of us to stay near Healdsburg for a trail running race at Lake Sonoma. The Big Oak Vineyard House was absolutely perfect for us. The location was great- just far enough from Healdsburg to feel "in the vineyards" but really only about a 5-10 min drive to town. 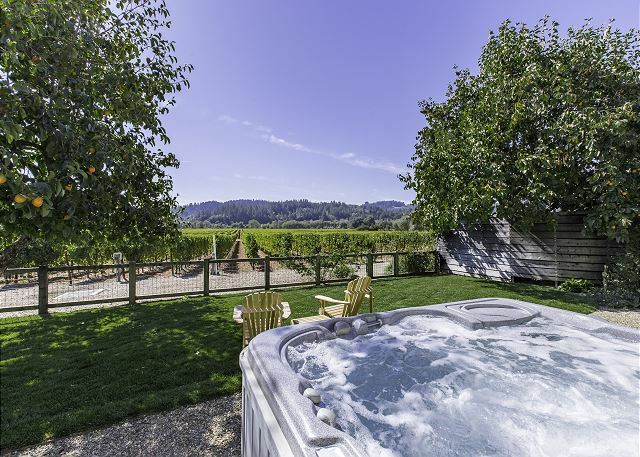 Hot tub overlooking the vineyards was great after the race. We loved the layout of the house as well for our group. House was very clean (and we have a few very particular travelers). Also loved the Weber BBQ in the back. Would definitely stay here again! Healdsburg is a LOVELY place for a girl's getaway! 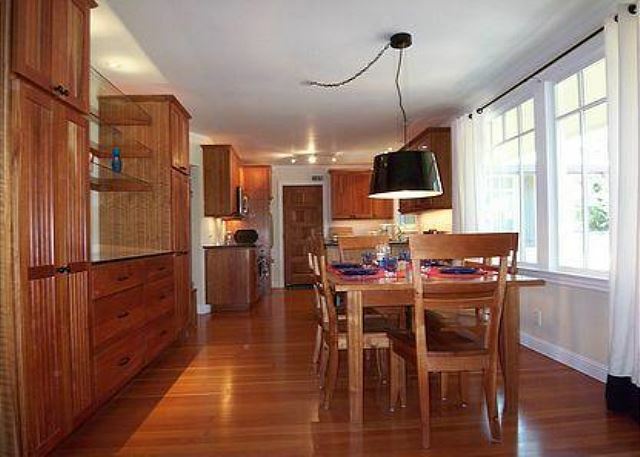 This rental house has the most ideal location for wine tasting, shopping and eating on the Healdsburg Square. What we appreciated most was their flexibility due to the poor air quality-they couldn't have been nicer! We had high expectations about the house before we arrived and it delivered. Lots of open space. Big bedrooms. Great to come home to after a day of wine tasting to sip purchases staring at the rows of grapevines out as far as you can see. Hot tub was a plus. The sky at night was full of stars. Morning walks through the vineyard right outside you back door was a great way to start the day. Woulvery convenient to Sonoma wineries especially downtown Healdsburg. Very comfortable house in ideal location! We had a great time at this home! Although we didn't spend a huge amount of time there, it was a lovely place to come back to at the end of the day. Walking the vineyard in the morning was fantastic and be sure to do a tasting at West Wines while you are there. Great wine and a great experience! We had a wonderful time in Healdsburgh. The house is in a great location, it was clean and a wonderful yard. We were trying to find a place really close to healdsburg downtown for a wedding. It was the perfect place. Huge open living room and kitchen, beds were very comfortable, and the view and location couldn’t be better. Kitchen well stocked for cooking. Backyard next to vineyard and West Wines. Spa out back is great in AM and evening! Lovely home and setting! Only complaint is that the TV was not working. Called about it and did not get a response. We were not at the house very much since we were touring vineyards, so not that important. We wanted to watch a football game and it was very poor connection. The big oak and surrounding vineyard was very scenic. 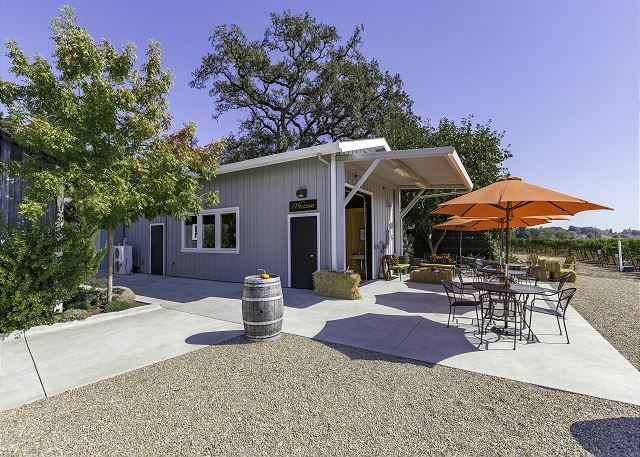 We had our two daughters and spouses join us for a wine weekend in Healdsburg and found this house perfect for our needs. Very clean and updated throughout. 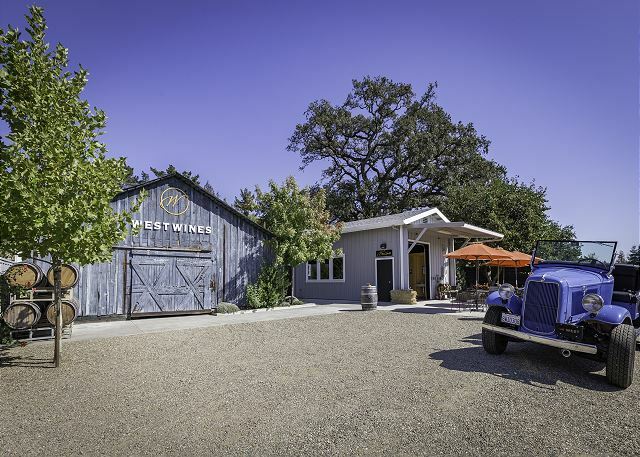 Also a great location just a short drive into town and good launching spot for some great Dry Creek wineries. We will probably rent this property again. 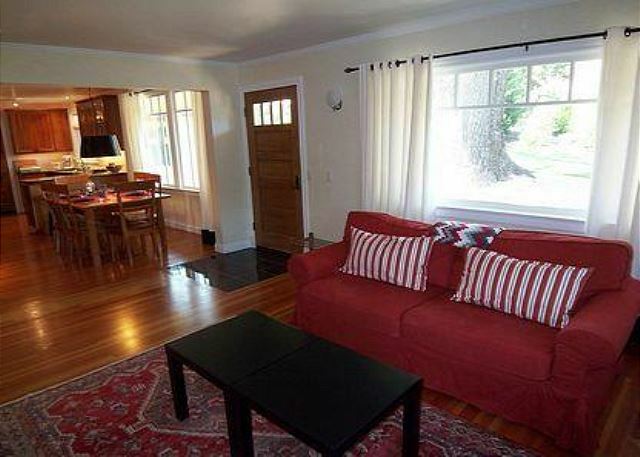 The property is in a WONDERFUL location in proximity to so many places. Downtown Healdsburg, Dry Creek Valley wineries, Hwy 101, etc. Even though this stay was during a heat wave and the start of crush, it cooled down at night into the 50's and was very refreshing in the morning. The Big Oak tree in front of the house was a good marker where to turn off of Dry Creek Road. Inside the house was clean and functional for the 3 guests (including myself). I've been traveling to the area for over 10+ years now. Depending on the number of people that I travel with, I would definitely stay here again. We had a great stay at the big oak house! It was very comfortable for our group and had all of the conveniences. Location was great and easy access to many of the local vineyards! We would definitely stay here again!